For this week’s blog I thought I would share one of my most recent projects with you. I made a set of four different silkscreen print designs. 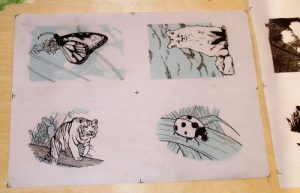 You can easily find many different tutorials and videos on how to do silk-screen prints, and process itself isn’t that difficult. I used a photo-emulsion paste in order to get my designs onto the silk-screen. But first I had to create the designs. I drew the initial sketch with a blue lead pencil and then inked over the top of them with Rotring Rapidographs of varying sizes. The next step was to create additional layers for each additional colour that I wanted to use. I chose green and a red-orange. Any further colours I would paint myself by hand, and that included the shadows. 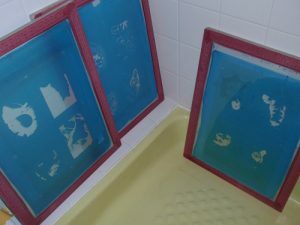 Finally I exposed my silk-screens with the photo-emulsion to light and “burned” the designs into the screen. This technique is also often used with photographs and Andy Warhol was an artist who was certainly famous for his use of silk-screens. Now that the silk-screens were ready, I mixed my printing paints. 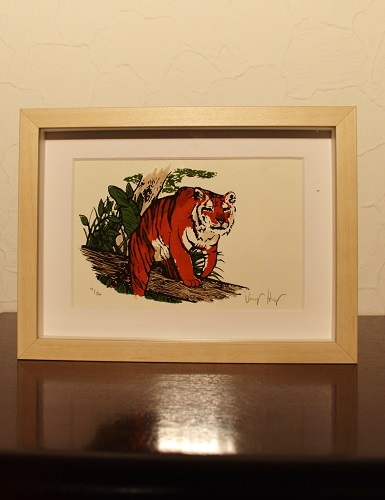 I used gouache, a water soluble paint that is often used to avoid clogging up the fine mesh of the screen. I also added a drying retardant to the mix to prevent the paint from drying in the mesh. Then I fixed each screen onto a wooden board with two clamps and placed my trial sheets of paper. Happy with the result, I continued the printing process and first printed the green background. I then overlaid the red-orange and finally the black. I took great care in lining up my silkscreens whenever I printed a new colour, otherwise the designs would overlap in strange places. Now all I had to do was to cut the sheets of paper with a Stanley knife into their respective sizes. In order to give each one its own finishing touches, I reached for my aquarelle water colours and brushes and individualised each print. I added the additionally required colours, shadows and decided to paint each of the fox’s eyes individually. Hi Véronique, I think I will try one myself, it looks so easy. I like it!